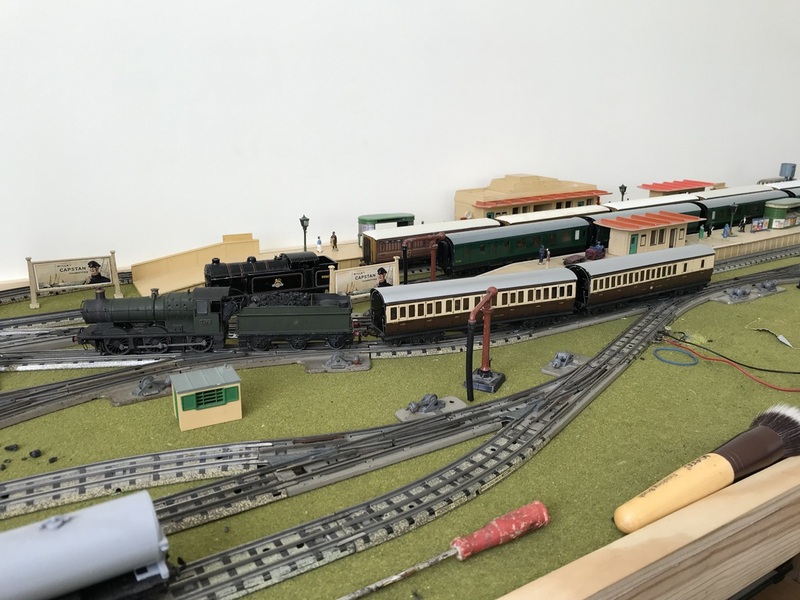 Thought I’d send you photos of my Kit built J39 I rescued which now runs pretty well ( with a few tweaks) on my dublo 3 rail layout. The alterations were done by retired friend Martin who is a restoration expert! First job was to change wheels. It had Romford wheels which were replaced with N2 non bushed ones, the centres unflanged so as to get round curves. The tender centre wheel flanges were also filed down for same reason. The chassis and motor were an old Triang jinty R52? 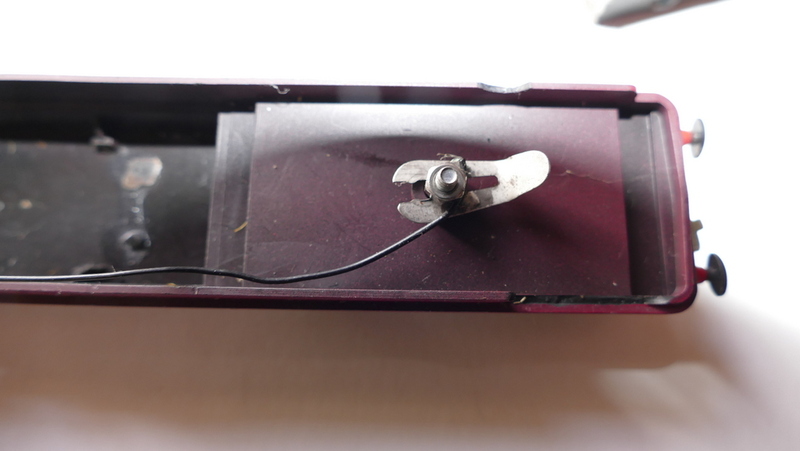 Martin first made a plastic insulating plate with sockets for Dublo standard 3 rail pickup but this didn’t work – despite all sorts of adjustments, the pickup mechanism was too low down and fouled track and points etc. 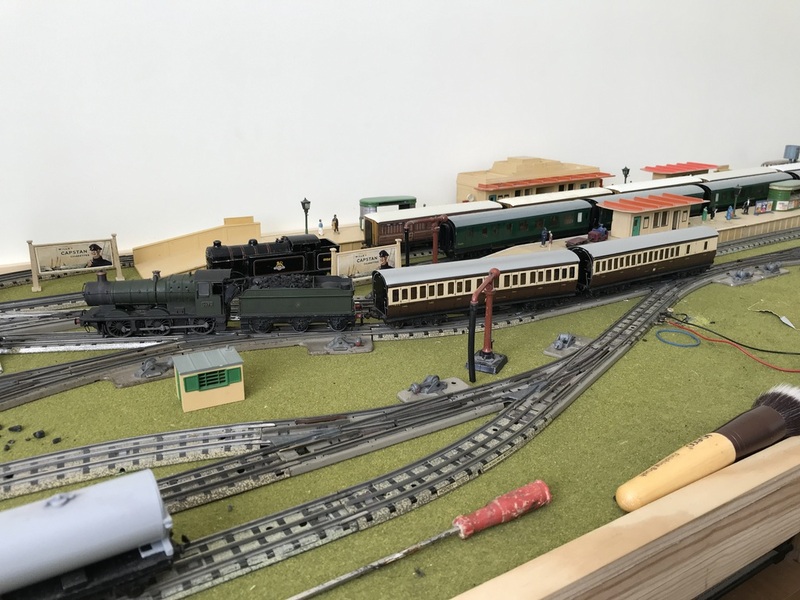 So we went back to your pictures of conversions, and took Train Society’s Damian Moss’s advice about using envelope fasteners. 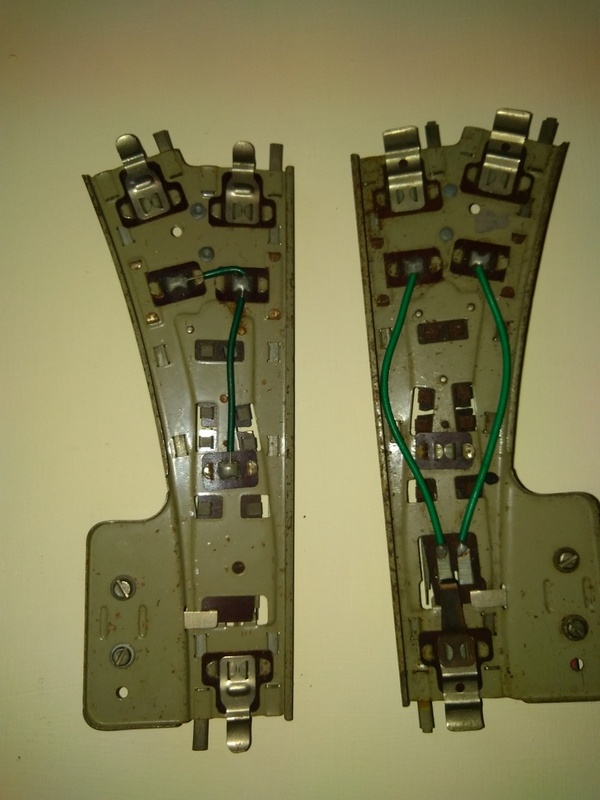 This time, Martin replaced plastic insulation strip with piece copper insulated board, attached to chassis with nylon bolts. Finally, he used brass strips soldered to board and envelope fasteners and with some tweaking to get improvised “shoes” to connect with rails, my J39 works well! Martin was pleased too as he’d never done anything like this before, so many thanks for your pictures which helped a lot! I thought I’d send you the results of my attempts to 3 rail a Mainline Collett 0-6-0. Here are the steps I took with friend Martin who is an HRCA member and is also quite a restorer of all sorts models not just old Dublo! 1) left side of chassis- unscrew tiny chrome bolt and rescrew in but with a couple of tiny fabric washers. 2) right hand of chassis- remove long black bolt from black left contact strip. Take care to hold contact strip in place as it retains in place spring and brush for armature. Solder wire to solder tag and rescrew in again with one or two metal washers. 3) I used a Dublo 3 rail castle chassis and soldered wire from pick up mechanism to connect with wire that runs from solder tagged contact strip. This particular tender had a second solder tag to the metal tender wheels as they had been insulated from base. That meant soldering an second wire which connects with a tag to a drawbar bolt under tender chassis. This effectually 3 rails the loco so no brief intermittent stopping over points etc. A “normal” 3 rail tender chassis doesn’t have this extra tag I think so wheels and body would just transmit electric contact via drawbar. 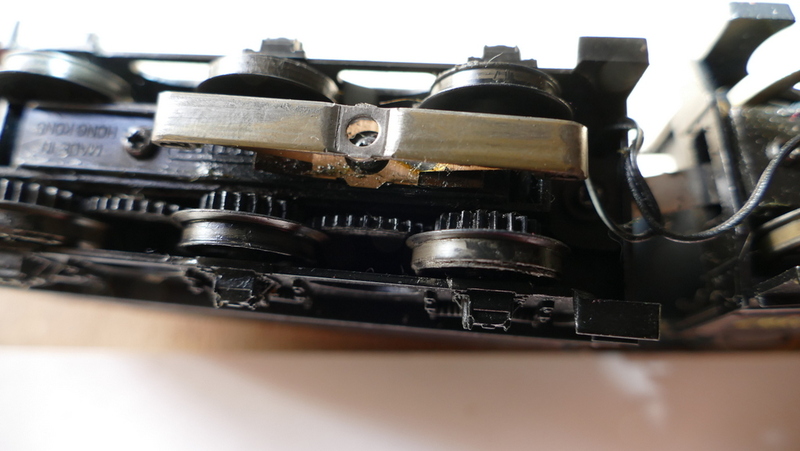 5) I then discovered at Model Rail Glasgow that you can get these tiny “plug connectors” which might make a neater job, though one modeller from Aberdeen Model Railway Society said he thought they’d be a bit finicky so he recommended sticking with small cable connectors! The older we get, we have less nimble fingers and poorer eyesight! 6) the original Mainline tender was cut from its chassis base and secured to Dublo Castle tender chassis with bolt and bits of glued plastic card to keep bolt it in place. 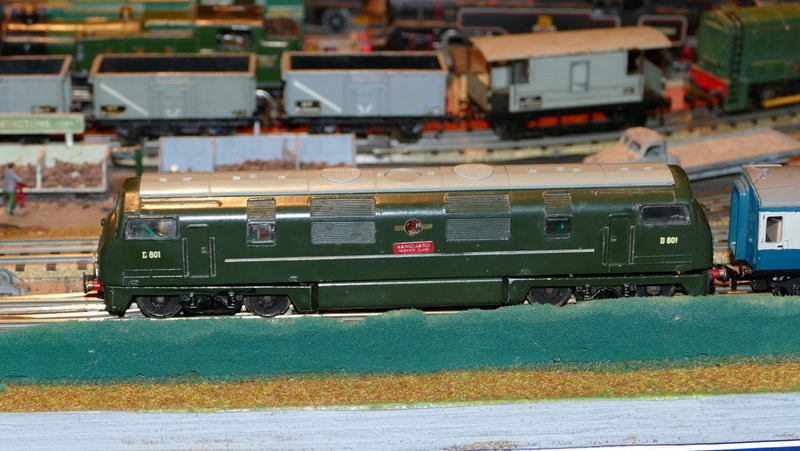 Damian a member of the Train Collectors Society sent me a couple of photos of a Mainline loco that had been DCCed. That’s was a very helpful guide as to figuring out split chassis electrics. Certainly lot easier with an “open type” armature of Triang type! Anyway, works well and looking forward to reassembling and using it on a GWR goods or local passenger. Will send photos. Hope this might be of help, I’m sure someone with more electrical know how can make a much neater job! 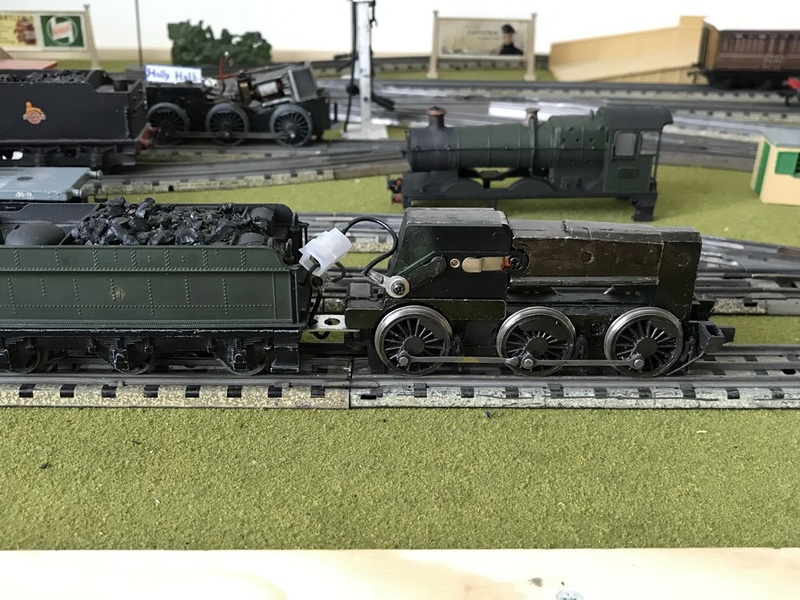 Here’s some photos of my reassembled Collett 0-6-0. Pretty finicky as Mainline body very tight so needed to file a wee bit of internal sides. But amazingly it works fine apart from discovering that rear tender pick up spring is a bit weak. Will have to get another! With tiny transfers – with help of magnifying glass! Mainline locos have plastic axles which I hadn’t foreseen and are prone to breaking so will see how long it survives. I’ve found an old J39 0-6-0 metal kit in bits but with a Triang jinty chassis. I’m wondering how to tackle that now, can you pass my request on to your friend Ray? The tender is complete and I’d have to saw it from its base to try and get a Dublo tender pick up in, but maybe there’s a simpler way if loco chassis is possible to 3 rail. Back in the day only a few years ago 3 rail conversions were frequently on sale on Ebay. and they were usually cheap, around £40-50 at the most. A chap called dublobear was prolific and his conversions were excellent runners and very varied but unfortunately he died about 3 years ago. There were others and my running collection has a lot of these conversions bringing added interest to the rather restricted HD range, But now things are changing. Are there more people running 3 rail and looking for them or are there fewer people doing the converting. Whatever. 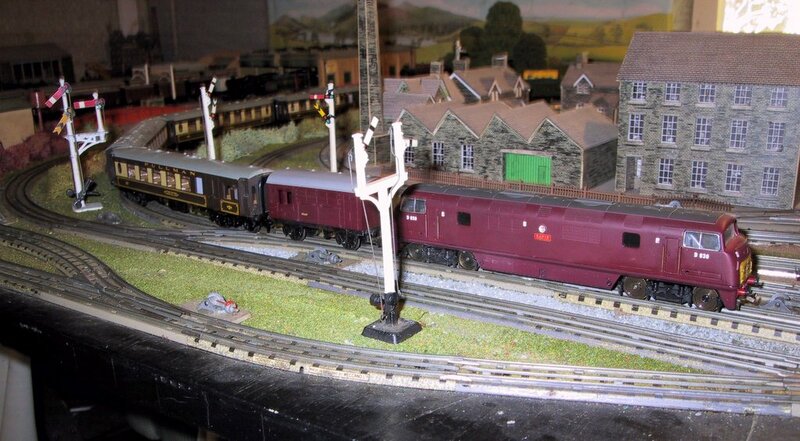 The result is that 3 rail conversions on Ebay are now attracting what is to me silly prices. 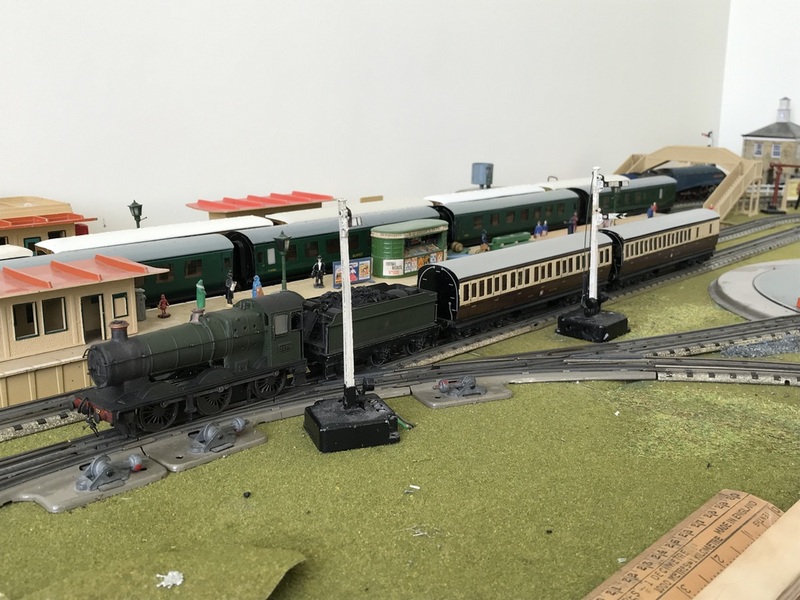 All three are Triang bodies on a Duchess of Montrose chassis which if compared with a true HD conversion – Hornby Dublo Barnstaple 3 rail conversion £87 seem to me to be very expensive but they do have a genuine HD chassis so should run OK. I missed that Barnstaple listing as I think that I might have bid even though I do have a Dorchester – that’s a decent price for a very tidy loco – you can never have too many Bulleid pacifics. 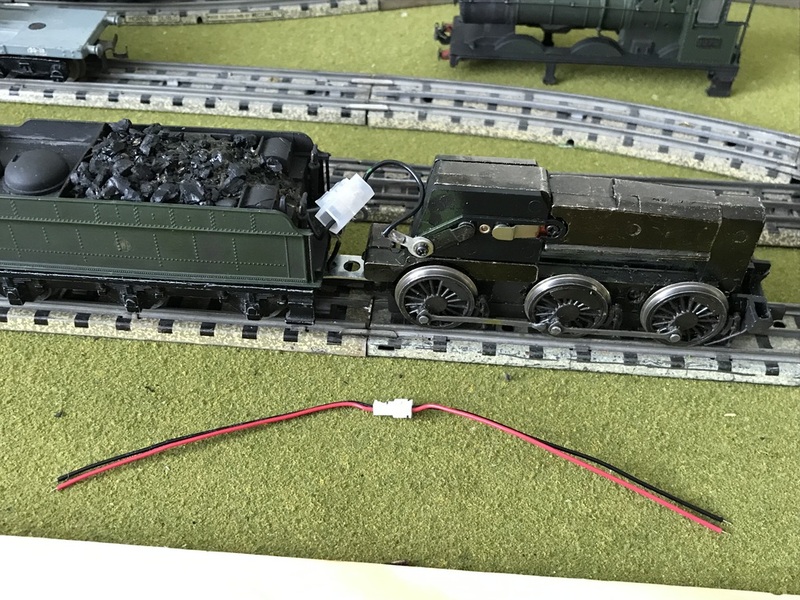 To me the most surprising conversion is that to a HD R1 0-6-0 loco which was only made in 2 rail but can easily be converted to 3 rail using a Marklin sled or even the ubiquitous springy bits of copper. 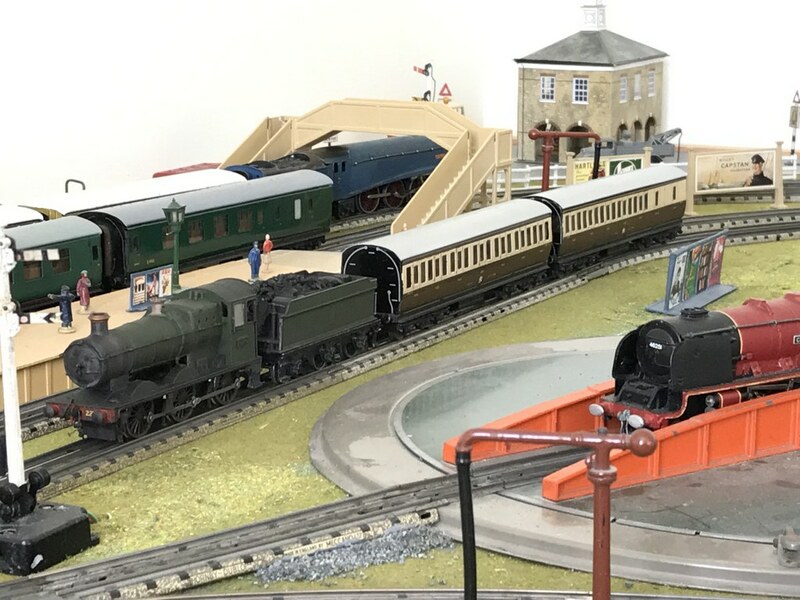 (these simple conversions are pictured in the conversions section of the website), Three 2 rail locos are currently available for under £30 and another couple under £35. Amazing then that 17 people bid and one paid £85.77 for a conversion to 3 rail- truly amazing. Even I can do these conversions and I have more thumbs than fingers. 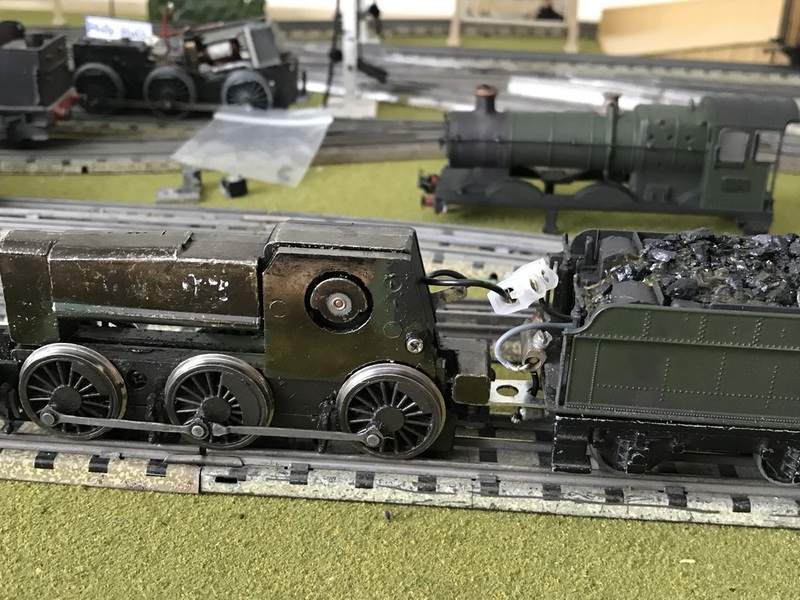 I have 8 of these chassis, 4 under HD plastic bodies, 2 under Gaiety 0-6-0T saddle tanks and 2 under Graham Farish tanks. I don’t think that anyone of them cost more than £35. The anniversary has been celebrated by Ronald Dodds with a series of videos. Talking of most expensive purchase,this my Wrenn Royal Scot which i bought a few weeks ago & converted to 3 rail hauling a rake of refinished Trix Mk1 coaches. 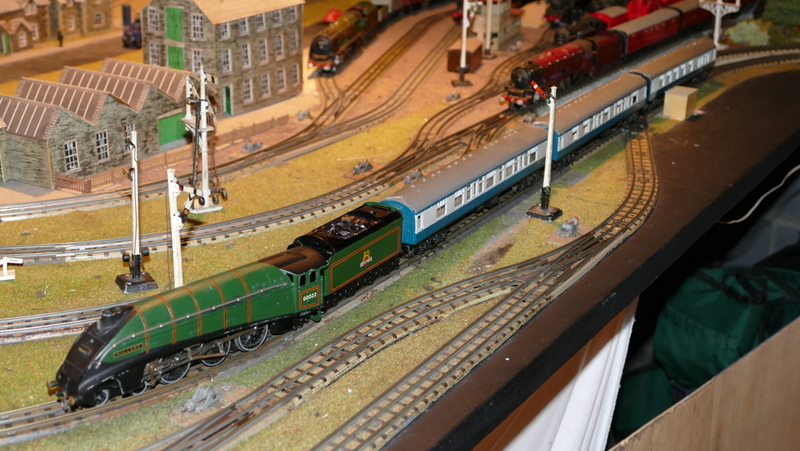 Whilst on the Trix theme, I thought you may be interested in my Transpennine unit running on my HD 3 rail layout. 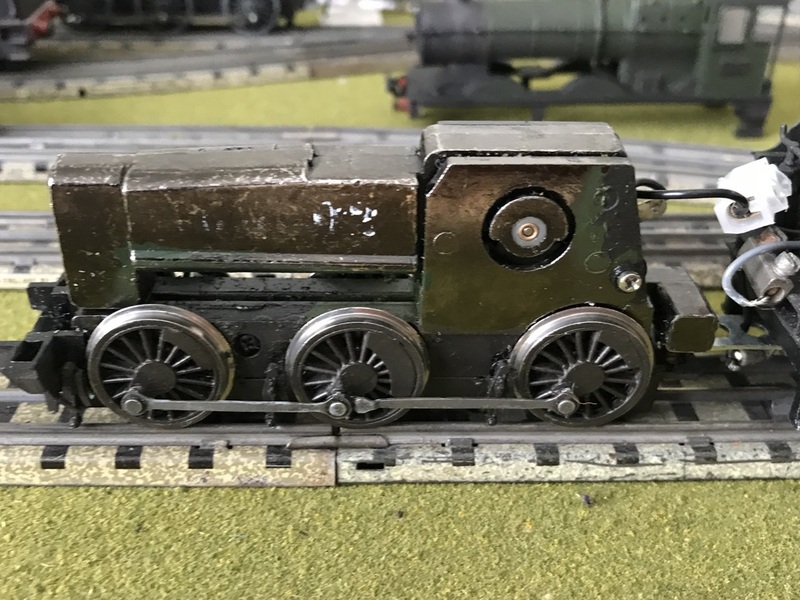 A Wrenn Spamcan converted to 3 rail using a Marklin skate.Clearances are very limited on these locos,you can`t fit a Hornby dublo collector unit unless you alter the chassis.I do have two of these locos. A modern Hornby 2BIL converted with a Marklin skate under the trailer car & power fed through to the power car via a plug & socket.I do have photos of all my conversions but i can`t post them on here. And finally for now,an Airfix tender drive Royal Scot with a Marklin skate under the loco.Sorry about the radio,i forgot to turn it off!!. A question raised in the latest comment. The point on the left is non isolating and the one on the right is isolating. When the point is switched to the main line the turning to the right in this case is isolated and an engine can be on this line but is dead. Both the main line and the turning are both live regardless which way the point is switched. Trucks can be left on this line but not an engine as it would be live to the controller. 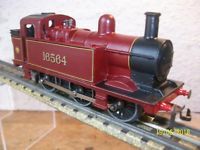 The last post mentioned a Triang Jinty with a HD R1 chassis converted to 3rail which sold at auction on ebay for what I thought was a staggering £107 plus postage. on ebay which went for £37.75. The vagaries of Ebay! 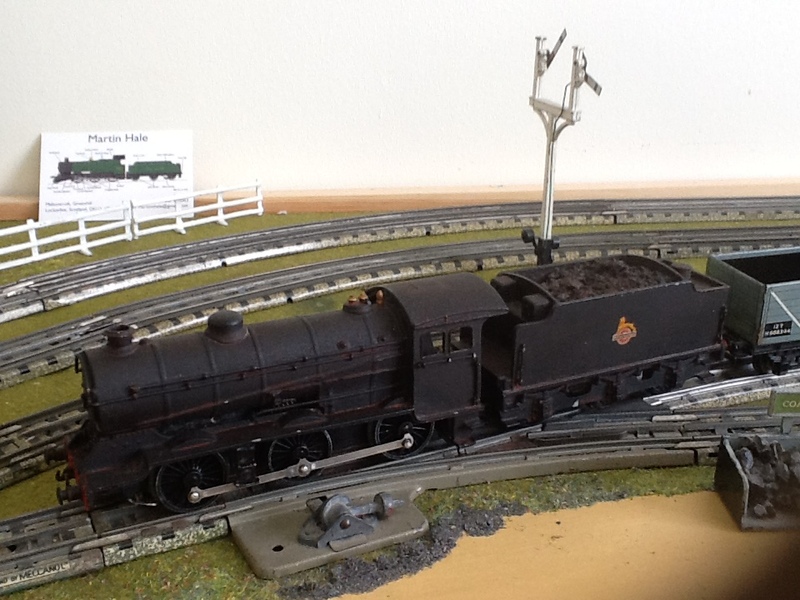 I am still happy with my Hornby B12 which is running well. I definitely don’t need any more engines but I still check out 3 rail locomotives on ebay just to see what’s about. I came across a Jinty based on an HD 0-6-0T which had been 3 railed. Now I have a 3 railed Triang Jinty so definitely did not need another but this one was in Crimson Lake so I put it on my watch list. I put in a bid fairly early on but was soon outbid and the final price was £107 plus postage. Which I thought was staggering. Well at the same time Rails of Sheffield was listing a Hornby LNER B12 3 railed at a BIN price of £39.50 and postage of £2 so I went for it. So £107 for a Jinty or £39,50 for the B12 – ebay is a funny old place but it induces you to buy engines you don’t really need. The B12 pulling a Triang converter wagon and two Trix maroon coaches. Behind is a Black Five also a Hornby conversion but this one is tender drive whereas the B12 is engine drive. William would like a Warship to run on his 3 rail layout. The easiest but not the cheapest is to buy a Trix 3 rail version although the scale is not 00 (slightly smaller) and running is just OK – see my previous posts on this. 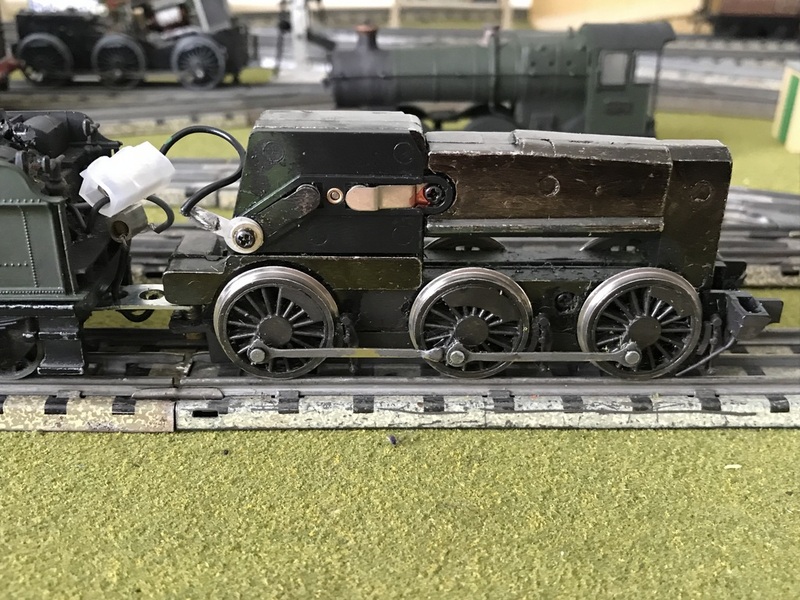 I also have a Lima one which I acquired as a 3 rail conversion back in 2007 and he would like to have a go at his first conversion on one of these. The Lima Warship is very simple, relatively cheap to buy and it would not be a financial disaster if it all went pear shaped. To match with HD it should be green or maroon as mine. Rail Blue came after HD was bought by Triang so my layout avoids this timeframe. Examples are available from ebay for around £40 as a BIN but bidding might get you a cheaper one. There are usually plenty available. Lets just review what has to be done before we look at my conversion. Now lets look at how my one was 3 railed. First take off the body. Carefully as it is held on by plastic lugs which are easily broken – mine are but the body sits on the frame OK but you have to remember to pick it up by the chassis. 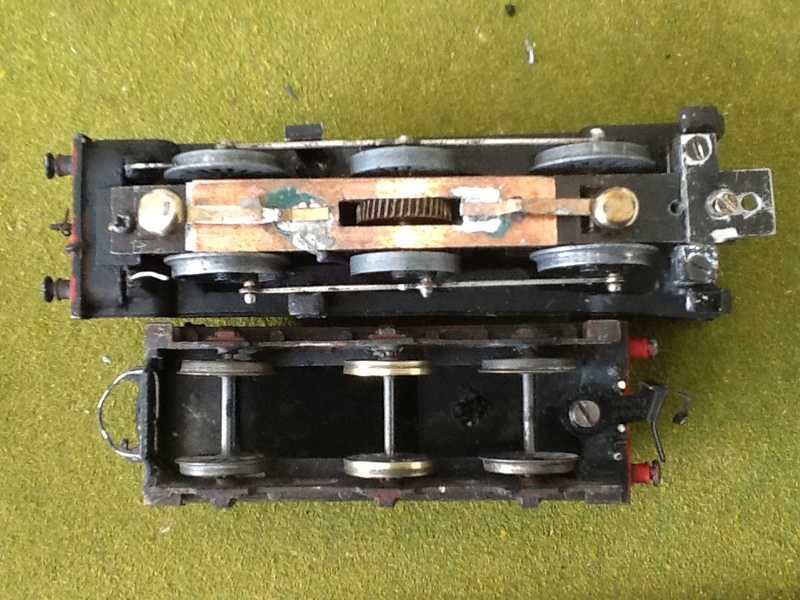 Power bogie, large weight, non powered bogie, One wire between the two. On the left extra lead weight to put on top of the weight, but it needs some more. The pick up is the ultimate bodge. Probably 2 paper clips or even drawing pins soldered onto springy copper. It works but it won’t last that long and I would recommend using a Marklin skate. 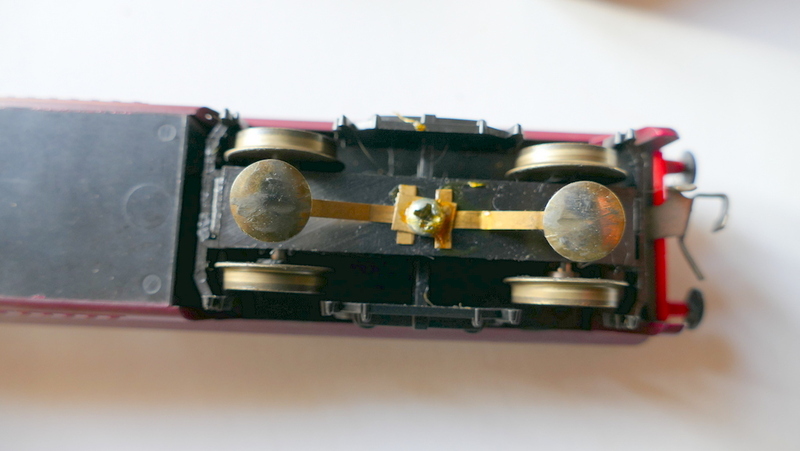 Everything on this bogie is plastic so there are no insulation problems that you can get with metal framed locos. I think that the clip that locks the nut came from the original 2 rail pick up. This conversion uses the original wire from the 2 rail pick up and therefore there is no need to solder a new wire to the motor, as this would be difficult unless your soldering is pretty good. So apart from ensuring that you are careful to ensure that you drill the hole in the correct place, lock the bogie that it swivels but is not too loose everything should be OK. So how were the wheels de-insulated. Well on my loco this is bodge number two. He has turned one of the non powered bogie wheels around so that non insulated wheel is on the other side resulting in 3 insulated wheels and 1 non insulated wheels on one side. Amazingly this works very well and the engine does not hesitate over points or X crossings. A more conventional method is to use conducting silver paint on the insulated wheels, as this bridges the insulation. Check after that the wheels really are de-insulated and then paint over the silver with matt black. The silver paint is available here and will last you for hundreds of conversions. It’s also good to know that if your drill slips when making your hole in the non powered bogie spares are available on ebay at a very reasonable cost. I hope that this diatribe helps, good luck and send me some pictures. I will try and help if you have problems. Late in the UK steam era British Railways introduced their new colour scheme of blue and grey for their carriages and there are many colour photos of these carriages behind steam trains. So I decided that was a good enough reason to add such a train to the layout. These coaches should have BR roundels on them but Trix had the “Arrows of Indecision” as they were introduced later, however the previous owner had removed them on these coaches so they fit in well. I think that they make a colourful and authentic addition to the rolling stock. Then I continued my Trix theme by buying a Trix 3 rail Warship. To the Trix scale, smaller than OO larger than HO, this looks OK and is shown pulling the Trix coaches. Despite its heavy metal body and traction tyres this is not a powerful runner and is very picky as to how well it runs. I have found that it only goes in reverse on the down track, other directions and tracks result in bogie induced derailments. Work is underway to produce a good runner on all tracks in both directions.